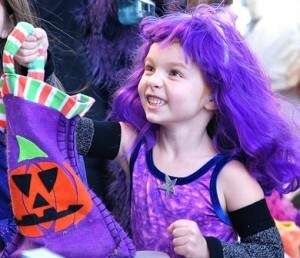 Rylie Nelson, 5, dressed as pop star Keira, gets a treat at Avidia Bank. Hudson – Costumed families flocked to Hudson&apos;s 25th annual Downtown Trick-or-Treats, presented Oct. 24 by the Assabet Valley Chamber of Commerce. Merchants distributed goodies as the Quinn Middle School Band played spooky music at the Town Hall, and scary stories were told at the Unitarian Church of Marlborough and Hudson. 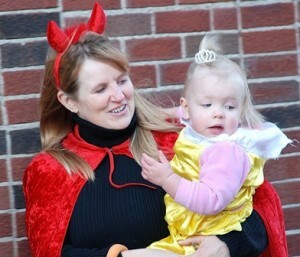 Karen Mercadant, costumed as a devil, holds her granddaughter, Emma Jordan, 22 months, as a princess. 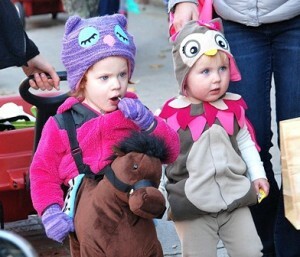 Waiting in line for their next treat are Ava Wagoner, 2, costumed as a horseback rider, and Samantha Cummings, 21 months, as an owl.